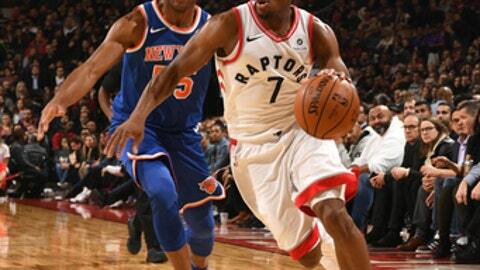 TORONTO (AP) The New York Knicks let a poor shooting performance contribute to a dismal defensive effort. It all added up to their eighth consecutive loss to the Toronto Raptors. Kyle Lowry matched his season high with 22 points and added 10 assists, DeMar DeRozan also scored 22 and the short-handed Raptors beat New York 107-84 on Friday night. New York’s Kristaps Porzingis shot 3 for 13 while Tim Hardaway Jr. finished 5 for 11. The Knicks went 30 for 92 overall, their lowest field goal percentage of the season. Hardaway and Porzingis each scored 13 points and Enes Kanter had 12 for the Knicks, who fell behind by double-digits in a poor-shooting first half and couldn’t recover. DeRozan scored 16 in the second half and Lowry finished with eight rebounds as Toronto won its third straight and improved to 5-1 at home. Toronto played without two injured starters in forward Serge Ibaka (swollen left knee) and guard Norman Powell (right hip). Reserve guard Delon Wright (dislocated right shoulder) also was unavailable. C.J. Miles scored 14 points for Toronto. Pressed into the starting lineup, second-year forward Pascal Siakam scored 13 points and rookie forward OG Anunoby had 11. Raptors coach Dwane Casey was pleased with his team’s defense, especially Siakam’s effort on Porzingis. ”I thought he did as good a job as you can do against Porzingis, who is a very dynamic offensive player,” Casey said. Porzingis agreed that Siakam had presented challenges for him. Jarrett Jack made all three of his shots in the first but the rest of the Knicks endured a difficult quarter, making just three of 23 attempts. Porzingis went 0 for 6 in the opening quarter and Hardaway missed a dunk. Lowry and Anunoby each scored seven points for the Raptors, who led 30-18 after one. Lowry had nine points and three assists in the second as Toronto led 54-36 at halftime. New York made five of seven 3-point attempts in the third but DeRozan scored 12 points for Toronto as the Raptors took a 78-64 edge into the fourth. Knicks: G Courtney Lee started despite a sore left hamstring. … All 10 of Michael Beasley’s points came in the fourth. … The Knicks matched their season low in points. They also had 84 in an opening night loss at Oklahoma City. … New York is 1-4 on the road. Raptors: Wright is scheduled to visit a specialist when the team is in New York next week. … Powell missed his third straight game. … G Lorenzo Brown was active for the first time this season. … Toronto failed to extend its streak of consecutive games with 125 or more points to three. … Former Raptors G Sonny Weems attended the game. Toronto is 9-0 this season when leading after three quarters. New York hasn’t beaten Toronto since a 111-109 win north of the border on Nov. 10, 2015, a game in which the Knicks benefited from a missed out of bounds call on Carmelo Anthony late in the fourth quarter. Knicks: Host the Clippers on Monday night. New York has lost 10 straight in the series. Raptors: Host Washington on Sunday afternoon seeking to end a two-game home losing streak to the Wizards.